TORONTO - After allowing viewers to gape at the excesses of the rich bride, support the frugality of the poor bride, and cheer the weight loss of the bulging bride, reality TV is dishing up a new twist to televised nuptials – brace yourself for the teen bride. Slice is currently casting in Canada for "My Teenage Wedding," a series that has raised eyebrows among some parents who worry the show may be cashing in on the vulnerabilities of young love and could negatively impact youth audiences. "I just think it's borderline inappropriate," she said of youth-focused reality show. "It's one thing to show adults in that light...and another to show minors exposing their mistakes and their vulnerabilities at such a raw and impressionable age, and by association making an impression and influencing youth who are watching." "Because they see themselves reflected back on the screen, a lot of kids now do think 'I could do that, I could be on that show,’” she said. "As a parent, I can teach my children what's appropriate and what's not…You need to have a dialogue." Those behind "My Teenage Wedding" say the show is a way to start that conversation if a parent is concerned about their child’s relationships or the impact reality shows might have. "It actually gives them a vehicle and a reason to bring it up," said Christine Shipton, vice president of original content at Shaw Media — Slice’s parent company — who notes she hasn’t heard any parental concerns from the airing of four pilot episodes in the spring. "If this is a point of view that you’re concerned is affecting your kids in a negative way, you need to talk to them about it." Response to the show’s casting call has been "robust" so far, said Shipton. Applicants have included teens from a variety of socio-economic backgrounds and sexualities. "We’re certainly not aggressively going out and saying ‘Ooh let's find the 15-year-old.’ There’s no sense of salaciousness like that," said Shipton. "It’s really a story about when a teen world meets an adult world," said Shipton. "It’s as much about the mother-daughter relationship, relations with siblings, relations with friends, and then of course the pay off — the wedding — and how we as an audience feel at the end about this couple." "If you want to connect with your kids, talk about things they’re interested in," said the co-founder of Momfaze.com, a website that offers advice for parents with teens. 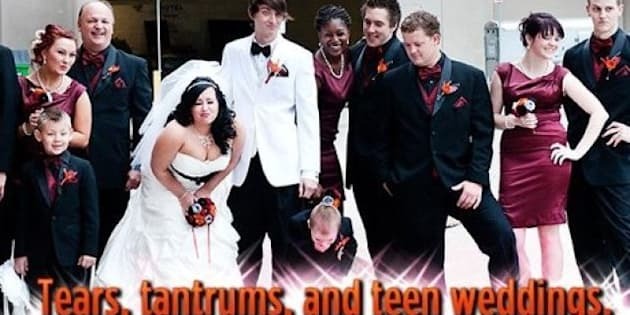 "If it happens to be Teen Wedding, then watch with them and ask them ‘What do you think about that? Would you want to be married at that age? What do you think about love?’ To me those would be great opportunities to talk to your kids." Parenting adviser and author Judy Arnall points out that adults shouldn't discount the ability of teenagers to make good decisions on their own. "Teens are very smart, they’re very savvy. They know a lot more than we give them credit for," said Arnall. "All through time kids have watched and listened to inappropriate stuff and that’s a very small part of a teenager's life. If it’s buffered by good relationships with parents… then they don’t have to worry." University of British Columbia professor Daniel Keyes, who has conducted research on reality TV, adds that while it's difficult to say just what message teen audiences take away from such shows, it could be one that differs from what producers aimed for. "Viewers might be making different meanings out of it. And it may be a positive thing," he said. "Sit down with your children and watch really bad TV tonight … you’re at least going to be talking about what values you have."